Browsing the shelves at some local libraries can seem like an anthropological expedition, a revealing window into how we once lived. Because libraries lack funds to update their collections, their shelves are too often populated with books that are increasingly outdated, irrelevant  or just downright insane. Enter a duo of Detroit-area librarians. Frustrated by aging tomes and seeking a way to enliven an upcoming industry-convention speech, Mary Kelly and Holly Hibner started Awful Library Books, a blog that catalogs the worst books found on local shelves. Among the anachronistic books cited are volumes on Halley's Comet's 1986 return, America's crazy attempt at a moon landing (1969) and the grand strategy of the USSR (which dissolved in 1989). 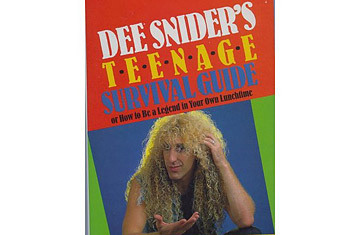 The pair's personal favorite, though, is Dee Snyder's Teenage Survival Guide, a book by the lead singer of the '80s metal band Twisted Sister  a man whose qualifications to guide teenagers through their formative years are dubious. Both Hibner and Kelly said they have been surprised by the fanfare  including links from several librarian websites and from the popular blog Boing Boing  their site has generated since starting in April. "It was just our nerdy project; we had a hard time getting our husbands to look at the thing," Kelly says. They field frequent requests to purchase the books highlighted on the site, although in true library fashion, they aren't for sale. But while the site remains a fun hobby for its creators, Awful Library Books has struck a nerve with frustrated librarians, particularly those in Michigan, whose economy has been among the hardest hit during the recession. Hibner said she spends a lot of her time helping patrons draft résumés and plan career paths. To offer a book like, say, 1978's Careers in Management for the New Woman as help is useless advice at best and nearly criminal at worst. The pair hope the blog does its part to highlight the need for libraries to weed their shelves  a task that requires proper funding. "Ideally, this site would die a natural death," Kelly says. Until then, we're content to kick back and read about Those Amazing Leeches  and marvel at the fact that such a book exists in the first place. See the top 10 literary stunts. See TIME's summer reading list.